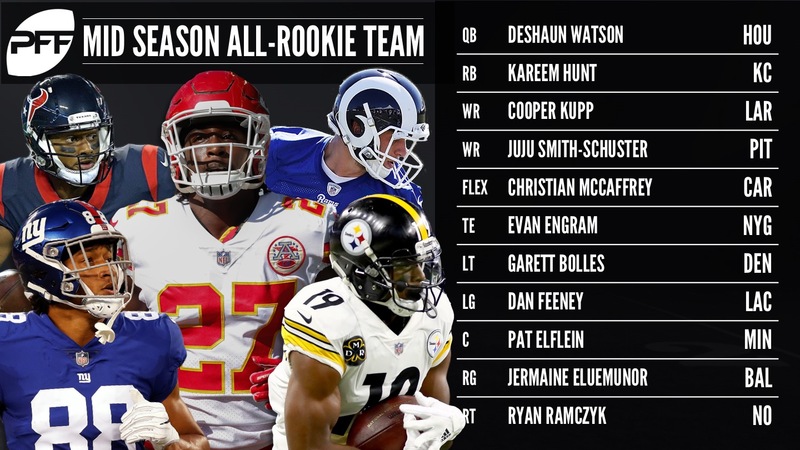 We have reached the half way point of the season, which means it is time to see which rookies have played the best with the PFF All-Rookie Team for the midway point of the season. For some positions like running back and cornerback, there was a lot of worthy players who missed out. For others, some players made the team by default of being the only player with significant playing time. This team comes from our exhaustive All-22 review process and the play by play grading of every player on every team in the NFL, giving you the most comprehensive analysis of who the top players really are anywhere on the planet. Elite Stat: Watson has an NFL passer rating of 124.1 when not under pressure; best in the league. We’ve gone into detail about why we aren’t as high on Watson’s start as others, but he had clearly been the best rookie quarterback of the group so far, before injury. In his last game of the season against Seattle he had the best game yet. The Texans will miss him the rest of the season, but once Watson fully recovers, Houston’s future will be bright. Elite Stat: Hunt has had 42 players miss tackles on his carries which is 12 more than any other running back. While Hunt has slowed down in recent weeks, he played well enough early in the season to maintain the top running back spot on both the all rookie team as well as the All-Pro team. He has 498 yards after contact which is tied for the most, and he’s also in the top five for running backs in yards after the catch. The only other rookie back within half the number of rushing missed tackles is Leonard Fournette at 25. Elite Stat: Kupp has had seven defenders miss tackles on his catches which is the most for wide receivers. The majority of highly drafted rookie wide receivers haven’t had a large impact on their team, but Kupp has been making an impact since Week 1, seeing 30 or more snaps in every game. His biggest impact has come after the catch where his 151 YAC is second-best for rookie wide receivers to this point. Elite Stat: Smith-Schuster has 1.94 yards per route run which leads all rookie wide receivers. Smith-Schuster makes the team almost entirely off of his Week 8 game against the Lions where he had 193 yards on seven catches. Thanks in large part to that game he has 219 yards after the catch. The only rookie wide receiver with more total yards than Smith-Schuster has after the catch is Kupp. His run blocking needs to improve to help his grade, but he is primed for more opportunities in the second half of the season. Elite Stat: Over the last four weeks, Engram has 2.26 yards per route run which is fourth-best for tight ends. It took injuries to the Giants wide receivers for Engram to become a big part of the offense, but he’s taken advantage. Engram is the only tight end with 30 or more yards after the catch in each of the last three games. He also has a touchdown in each of those three games. His run blocking has brought his grade down, but in almost every statistical category he leads the rookie tight ends. Elite Stat: McCaffrey has a drop rate of 1.8 which is the lowest for running backs with at least 35 catchable passes. While McCaffrey is technically a running back, he’s outperformed most rookie wide receivers when lined up at receiver. Isolating just the plays where he lines up at wide receiver, he has a receiving grade of 76.5 which is third-best for rookies behind Kupp and Smith-Schuster. He’s also coming off his best rushing performance of the season where he averaged 2.5 yards per carry after contact. Elite Stat: Bolles has a 95.1 pass blocking efficiency in his last four games after having a 92.7 pass blocking efficiency in his first four. Which Bolles has had some rough games in pass protection against better pass-rushers, he’s graded out as one of the best tackles in run blocking. His pass protection has improved in recent weeks, allowing three or fewer pressures in each of the last three games. Elite Stat: Feeney allowed no pressures across 30 pass-blocking snaps in his first start in Week 8. Feeney has spent most of the season coming in sparingly before finally receiving his first start in Week 8. He has yet to allow a sack this season and has been equally good in run blocking as he has been in pass protection. No rookie guard has started more than three games this season, which is why Feeney can make the team with one start. Elite Stat: Elflein has a pass blocking efficiency of 98.0 over the last two games after having a pass blocking efficiency of 94.9 in his first six. Elflein is the only rookie center to start every game, where the most any other rookie center has started is three. On the bright side, he hasn’t allowed a sack in seven of his eight games. He has also notably graded well on screen blocks. On the down side, he has allowed more pressures than one would like from a center, and hasn’t graded well as a run blocker. Elite Stat: Eluemunor is the only rookie right guard with over 100 pass block snaps. Eluemunor has seen playing time due to Ravens starting right guard Matt Skura seeing an injury. He has played as expected, allowing one or two pressures per game in most games, and struggling the most against the strong Vikings defense. In that start, he allowed three pressures and was also penalized twice. Elite Stat: Ramczyk has a 96.7 pass blocking efficiency which is tied for 10th-best among all offensive tackles. Ramczyk has been the most impressive rookie offensive linemen to date. He’s made starts at both left tackle and right tackle, hasn’t missed a snap yet, and has never allowed more than three pressures in a game. His most recent start against the Buccaneers was his first not allowing a pressure in a game. Elite Stat: Tomlinson has 13 run stops which leads all rookie defensive tackles. While the Giants run defense hasn’t lived up to expectations, Tomlinson against the run has exceeded his. He is coming off of his first four-run stop performance. His 15.4 run stop percentage this past week was the second-best for all defensive tackles. He has also made more of an impact as a pass-rusher in recent weeks. He has five hurries in the last two games compared to two over the first six. Elite Stat: Allen has a pass-rushing productivity of 12.0 which is second-best for all 3-4 defensive ends. Due to injuries, Allen has only been able to play in five games this season, and he might not be back this year. Despite the limited time, his three sacks leads all rookie interior defenders, as do his three quarterback hits and 10 hurries. While he’s mostly played in pass-rushing situations, he’s made his presence known in the run game with five run stops; tied for the most for rookie 3-4 defensive ends. Elite Stat: Lawson has a pass-rushing productivity of 15.1 which is third-best for edge defenders behind Von Miller and Cameron Wake. Rushing almost exclusively from the right side of the defensive line, Lawson has gone up against opposing team’s best pass protectors with great success. He has brought in 35 total pressures this season, tied for fifth-most among all 4-3 defensive ends. All 35 of those pressures have come from the right side, as he leads the league’s edge defenders in pressures from the right. Elite Stat: Of 4-3 defensive ends with at least 50 pass-rushes from the right side, Garrett has the best pass-rushing productivity on that side at 15.4. Garrett has only played in three games so far, but in those three games he has looked exactly like the kind of player you expect in a first overall pick. His four sacks all from the right side are tied for fifth-most for 4-3 defensive ends despite everyone with equal or more sacks to him having more than twice as many pass-rushes. Cunningham has made his mark on the Texans run defense with a few big games including this last week. He had four stops against the Colts which was his second four-stop performance of the year. His 11 run stops on the season is the most for rookie inside linebackers. Elite Stat: Foster has 16 tackles, which is the most for all inside linebackers who haven’t missed a tackle this season. While other rookie linebackers have had larger roles over the first half of the season, Foster’s play has stood out enough in his limited time to make the team. He is coming off of an eight-stop performance against the Cardinals. In coverage, he has a pass breakup and no touchdowns allowed. Elite Stat: Lattimore has allowed a passer rating of 37.4 which is second-lowest among cornerbacks. 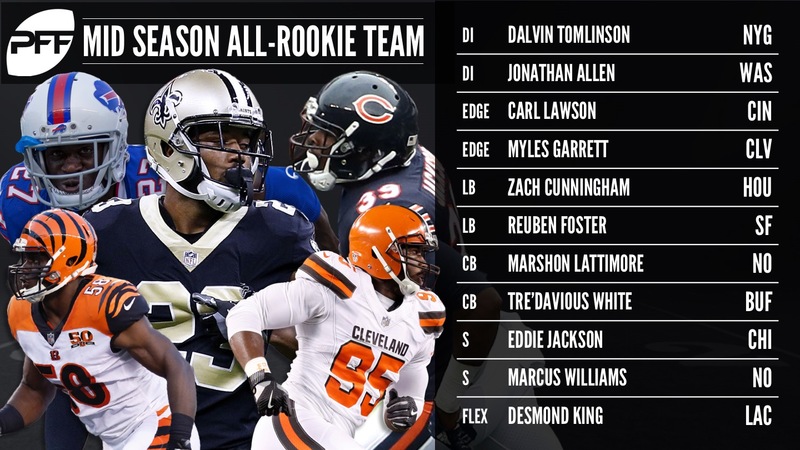 Lattimore is one of two members to make both the All-Pro Team and the All-Rookie Team. Of cornerbacks with at least 250 coverage snaps, he has allowed the second-fewest yards at 160. He has yet to allow more than 38 receiving yards in a game, and hasn’t allowed a touchdown. In nine short weeks, he has already become one of the best cornerbacks in the NFL. Elite Stat: White has nine pass breakups which is second-most for all cornerbacks. While White’s season has been overshadowed by Lattimore, he’s had an excellent season for a rookie cornerback. He’s allowed a 50 percent catch rate or lower in all but one game this season. Despite some teams testing him, he hasn’t allowed more than four catches in a game. Elite Stat: Jackson has a 14.5 tackling efficiency which is the best for all rookie safeties. Jackson became a Day 1 starter with the Bears, and after a slow start to the season has been excellent in coverage. He’s allowed just 37 yards over the last six games, and has an interception and two pass breakups in that time. He doesn’t have as many interceptions as other rookie safeties, but he has played more mistake-free. Elite Stat: Williams has allowed 0.21 yards per coverage snap which is second-lowest for rookie safeties. While Lattimore has played a big role in the Saints defense turning things around, their second-round safety Williams has also played a pivotal role. He’s allowed just three catches while playing an every-down role all season. On those plays, he allowed just nine yards after the catch, and also has an interception on the season. Elite Stat: King is 1-of-6 cornerbacks with 170 or more coverage snaps in the slot, and no touchdowns allowed from the slot. King has emerged as the Chargers slot cornerback in their nickel defense, and has played well especially over the last month of the season. Since Week 5, he’s allowed 6.8 yards per catch, which is the lowest for cornerbacks who have allowed 10 or more catches. Elliott has made 14 field goals this season with a distance of 40 yards or more, which is the most for all kickers this season. Only 26 percent of Sanchez kicks have been returned this season despite only one kick ending as a touchback. His rate is the second-lowest in the league. 20 times he has pinned opponents within their 20-yard line which is tied for second-most among punters. Jackson is one of two players this season to manage 150 or more return yards as both a kick returner and a punt returner. While he hasn’t had a return of more than 50 yards and hasn’t had a return touchdown yet, he’s consistenly been able to get yards more often then most. He’s made nine tackles on special teams plays so far, which is the third-most for all special teams players, and the most for all rookies.